Nestled deep in the Bernese Overland, the picturesque town of Grindelwald, Switzerland offers unparalleled views of the Eiger, Mönch, and Jungfrau peaks - but, it offers adventure too! If you’re looking to do something a little different, why not try the longest sled-run in Europe or perhaps, the world! 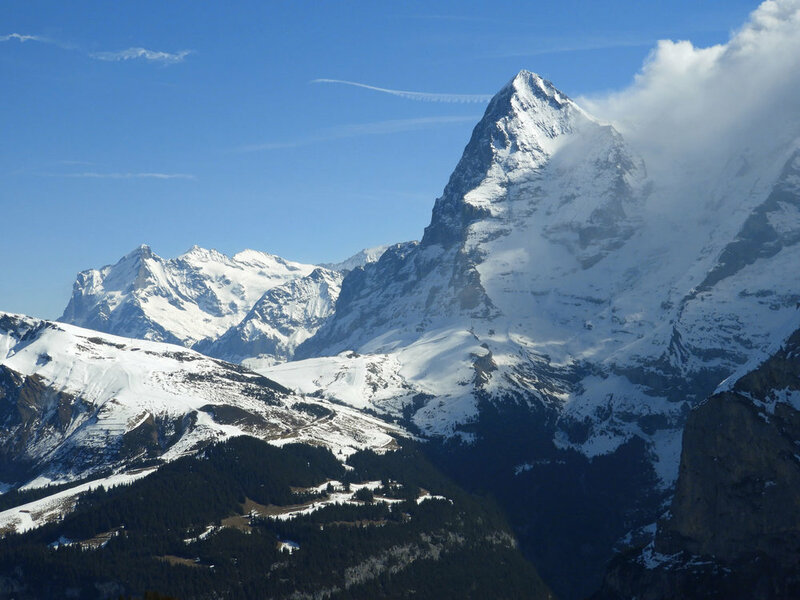 The “Big Pintenfritz”, running from the Faulhorn (2681 m) to the town of Grindelwald (1050 m) is a 12.5 km sledding extravaganza, with an elevation drop of 1600 meters! Here’s how it works. We parked in the Parkhaus Eiger, which is right next to the Grindelwald Bahnhof (we paid just shy of 20 CHF to park for 5-6 hrs). Parking is limited in Grindelwald, so we didn’t find any cheaper alternatives. You can park at the Interlaken Ost train station for 5 CHF a day, but purchasing train tickets would have been more expensive for us than to pay for parking. Plus we were on a time crunch to catch that bus! Bus tickets were easily purchased at the ticket booth at the bus bahnhof. If needed, Sleds can be rented at Bussalp, but we brought our own. A single bus ride is 24 CHF, or an unlimited day ticket is 48 CHF per person. We figured we didn’t have time or energy to complete more than one trip, and even if we needed to buy another ticket, there was no way we would fit three runs in during one day to make an unlimited day ticket necessary. The bus driver was quite the jokester, but due to our language struggles, we didn’t catch much. Check out the Grindelwald Bus website for maps and the bus timetable. The bus ride from Grindelwald to Bussalp is approx. 40 minutes. From there, the hike from Bussalp (1800 m) to the Faulhorn (2681 m) is about 5 km or 2.5-3 hrs, all while pulling your sled along. Don’t forget to layer up! It was bright and sunny at Bussalp, but frigid and freezing (-13 celsius) at the Faulhorn. The hike is beautiful, but not for the faint of heart. Regardless, each step was worth it to be able to zip down the mountain for 12.5 kilometers, all the while looking the Eiger, Mönch, and Jungfrau peaks right in the eye! Remember that 3 hour hike? We zipped down the 5 km from the Faulhorn to Bussalp in a mere 20 minutes! You go fast! And from Bussalp, we were back to the town of Grindelwald in about another 25 minutes. Darting down the mountain, riding low, bouncing around corners, we felt as if we were in a real-world version of Mario Kart. So awesome! While making the trek up the mountain I thought “there is no way I could do this more than once”. But once I was racing down the mountain, I thought “I could do this all day”! We didn’t catch the bus until noon, so logistically, this wouldn’t have worked for us, but if you get an early start, perhaps the 48 CHF day ticket would be worth your while. We were pleased with the bus, but alternatively, you could take the cable car from Grindelwald to First for 30 CHF (one way, I believe) and hike to the Faulhorn from First. This route has 368 m less elevation gain and passes by the Bachalpsee. Sleds are available for rent on that side as well. Top tip: In need of a bathroom? There is a free restroom located directly across from the Grindelwald Train Station (kitty-corner from the bus station), and in the lower level of the restaurant at Bussalp. Who doesn’t love a free-pee?! In Europe, these can be few and far between! You’re welcome.